So I’ve been sitting here, on my kitchen floor, right up against the stove (because it’s so warm and cozy), staring at my computer screen for the last twenty minutes just kind of twiddling my thumbs about how to start this post and what exactly to chat with you all about. 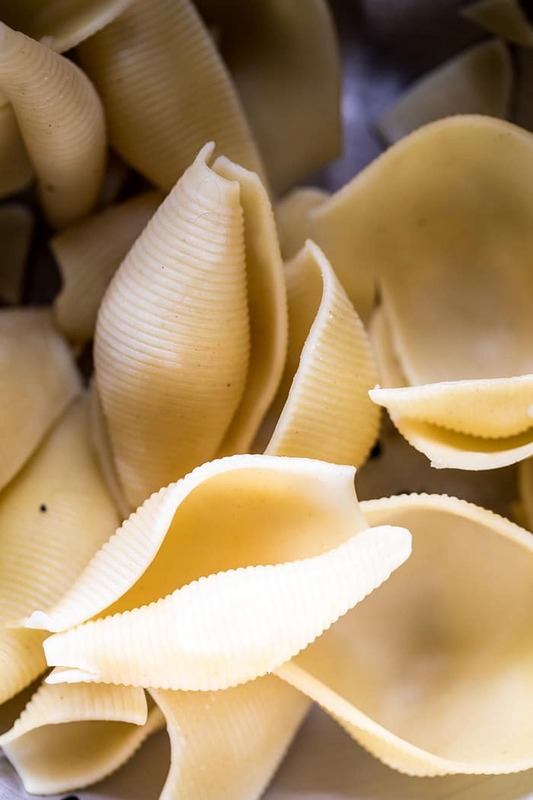 Sure, I want to tell you guys all about these delicious, cheese filled pasta shells, but it’s just been one of those long days and my brain feels fried. There’s also so much I have to share outside of this recipe that I am not even sure where to begin. Basically what I am trying to say is that my thought process is all over the place. I have a ton to say, but I’m not sure how to write down the proper words to express my thoughts. Does that make any sense? Probably not, but you sort of get it, right? Good news is that I’ve now gotten the hardest part about writing the day’s post done…I started it! 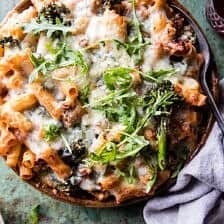 Alright, so now that I explained where my head is at, I’m feeling like I can dive into the post for real and tell you guys about these cheese filled pasta shells! Believe it or not, this is my first jumbo pasta shell recipe. For the longest time, I had two boxes of jumbo pasta shells sitting on my pantry shelves, but every time I’d go to use them, the long cut pasta (angel hair, spaghetti, bucatini) would stare me down, and somehow seem like a better fit for whatever recipe I was creating. To be fair, I am a long cut pasta person all the way. It’s just what I know and love. But, there is a time and place for shells…especially shells that are filled with cheese! This past week I finally bit the bullet and decided to make stuffed shells. I got home from hiking one day and was just in the mood to create a baked pasta dish. When I saw the shells, I knew cheese filled shells were in my future. I had a ton of ricotta, fresh basil, and a pound of spicy Italian sausage in my fridge, so the recipe was pretty much set. 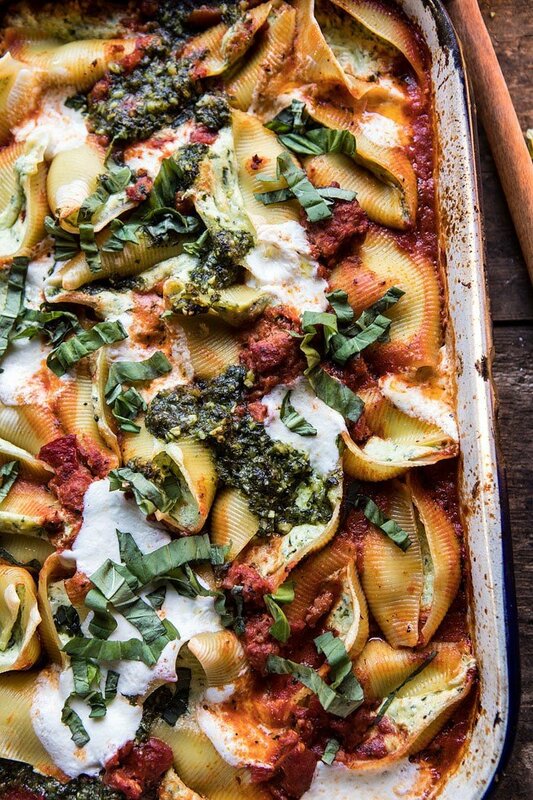 I made a quick ragu style sauce with the spicy sausage, then stirred together some homemade basil pesto with a container of ricotta, stuffed it all inside my jumbo pasta shells, and put it all together. Then into the oven it went (with a little more cheese on top…of course), and thirty minutes later, I had this yummy dinner ready to go. And guys? It. Is. GOOD! 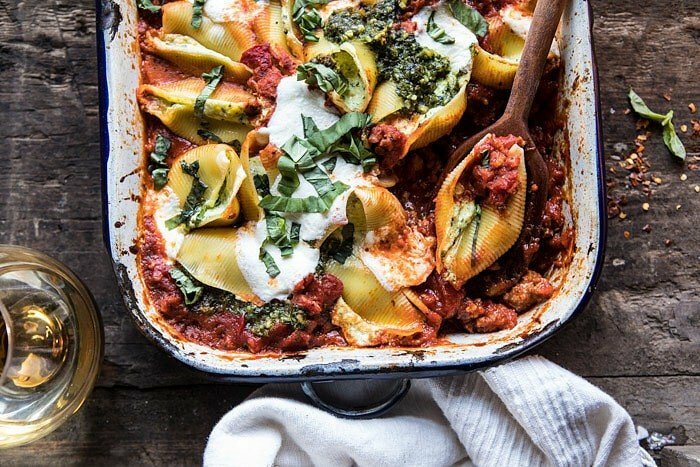 Think of this dish kind of like a manicotti, but in shell form, and probably a little easier to make than manicotti too. For the sauce, I love using a spicy sausage to add flavor without having to cook the sauce all day long. I also use a little vodka in the sauce to give it an extra kick. Plus, I just love all vodka style Italian sauces. The ricotta filling though? That’s the best part. If you guys haven’t noticed, I love basil pesto, so anytime I have extra basil on hand, I make pesto and then use the pesto in all kinds of recipes (hello to this lobster with polenta and pesto and this pesto pasta bolognese). It’s one of my favorite ingredients. I stirred the pesto into the ricotta to add plenty of basil flavor. It’s seriously the best, and I love the pesto cheese combo with the spicy red sauce. Perfect dinner to entertain with this holiday season. You can prepare the dish in advance, keep it fully assembled in the fridge, and then bake before serving. Love dishes like this for holiday entertaining…they make life so easy! Prepare in advance, keep fully assembled in the fridge, and then bake before serving, the perfect dinner to entertain with this holiday season! 1. Preheat the oven to 350 degrees F. Lightly grease a 9x13 inch baking dish. 2. Heat the olive oil in a large pot over high heat. When the oil shimmers, add the sausage and brown all over, about 5 to 8 minutes. 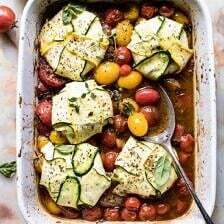 Reduce the heat to low and add the tomatoes, vodka, oregano, crushed red pepper flakes, and a pinch each of salt and pepper. Simmer for 15-20 minutes or until the sauce thickens slightly. Taste and adjust seasonings as needed. 4. In a medium bowl, combine the ricotta, provolone, and 1/2 cup pesto. Transfer the mix to a gallon size zip top bag and snip about a 1/2 inch off of one corner of the bag. 5. To assemble, spoon 3/4 of the red sauce in the bottom of the prepared baking dish. Working with one pasta shell at a time, pipe about 1 tablespoon of the cheese mixture into each shell, placing the filled shell into the baking dish as you go. 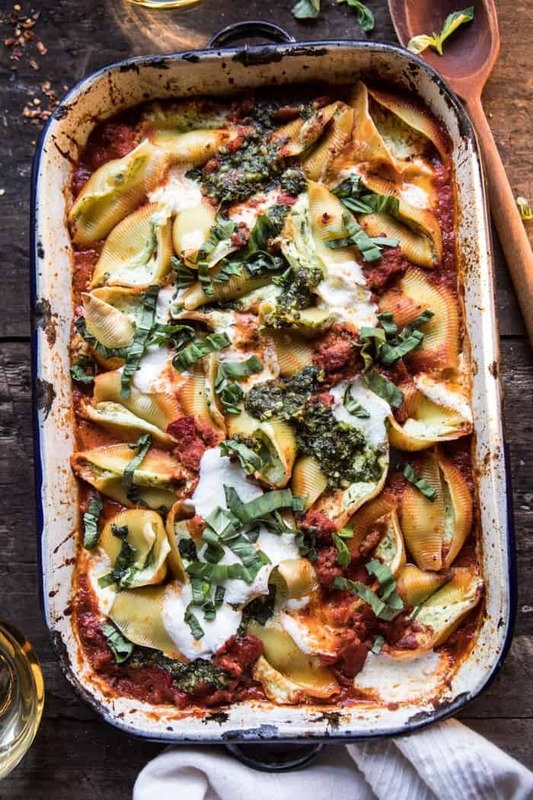 Spoon the remaining red sauce over top of the shells and then drizzle the remaining 1/4 cup pesto evenly over everything. Add the mozzarella. 6. Transfer the baking dish to the oven and bake 25-30 minutes or until the cheese has melted and is lightly browned on top. Cool 5 minutes before serving. Serve with fresh basil. Enjoy! PS. the red and green color combo? Yes, I did that on purpose, and yes, I love it…so festive! Totally get it – give yourself permission to take a writing break and just let that creative spark hit you when the time comes. I know you have deadlines, but try not to overwhelm yourself. Hang in there and happy Wednesday! And yay for a perfect wintery pesto-packed pasta meal. This recipe is calling to me!! I need it — as in immediately. The flavors that are going on are spectacular! This is winter — gone are the light salad based dished. I want pasta. I want cheese. I want sausage. And I want it all together. YUM!! Can’t wait to make it!! Thank you Marisa! I hope you love this! 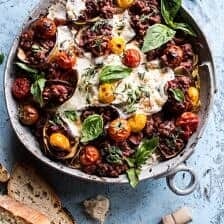 This looks amazing- Any way you could suggest to adapt it for veggies, please? I’m concerned veggie sausage may not work very well so would mushrooms work instead?? 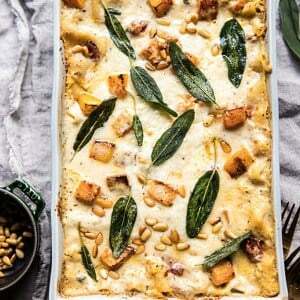 This looks delicious- but how much ricotta cheese? I don’t see an amount. Ok so I now know what I want to eat for dinner for the next 6 months. These are almost like a much easier form of ravioli?? The cheesy filling in that thick tomato sauce is just perfect. Definitely saving this one for later! Ahhh this looks so cozy for the holidays! Haha that is too great! I hope you both love this Christina! Thank you! Sounds incredible! I think I’ll be making this over the weekend… The weather is calling for a large plate of comforting pasta! YES! I hope you love this! Thanks Caroline! 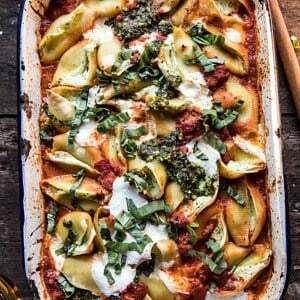 I love these stuffed shells and think they’re a prefect hot dinner! 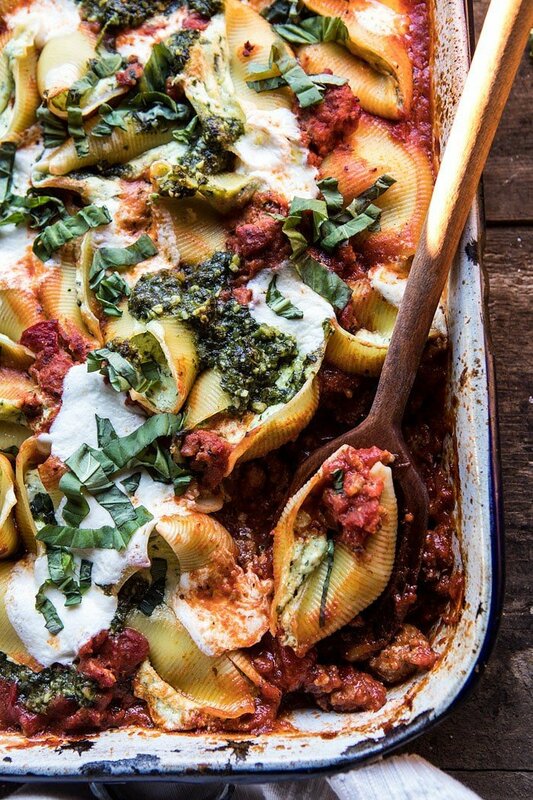 I’ve been wanting to make manicotti but like these little shell cups instead. Also, I love the basil ricotta mixture and am looking forward to making this for my mom and step brother (he gets into town Friday! 🤗). I’m sorry you’ve had a long day. I hope you’re staying warm, and hopefully you’re having a restful night and can recharge for tomorrow. 🙂 Maybe a warm shower and some extra blankets will help you relax and clear your mind a bit! I hope they love these! And I hope you have a great time with your family Kristin! Thank you so much! This looks perfect and comforting!!! 2 cans of 28oz tomoatoes?? or 2 14 oz cans? Could you other kinds of pastas and pestos for this? Like a whole wheat pasta? Thank you TIeghan for a most inspiring post! I enjoy making my own pasta, so you inspired me to use your pesto/cheese filling, meat sauce. I made sort of a manicotti. I laid out the ribbon of pasta, put a couple tablespoons of cheese, and roll them up! I sauced them in a casserole and baked…more cheese on top! Oh yeah!! Winner dinner! Thank you! Sounds so yummy! I am really glad you enjoyed this! Thank you!! 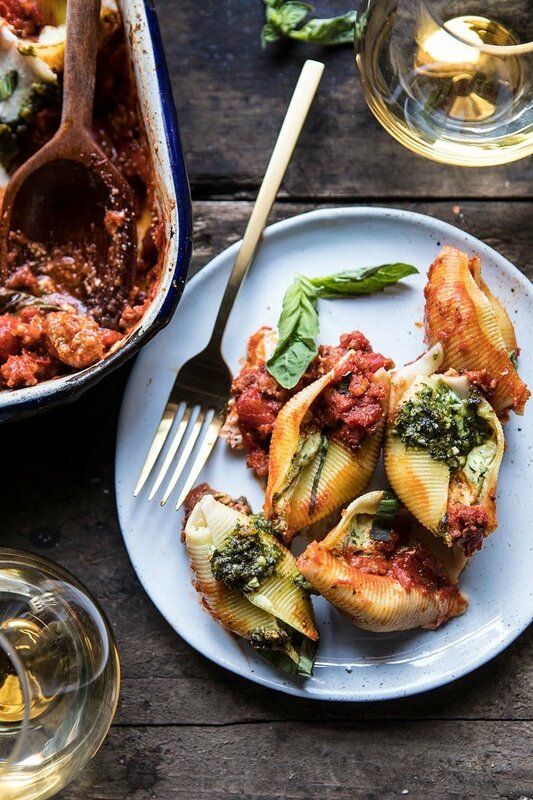 Hey, just curious bc these look delicious, but do you place the shells in order and all or just kinda toss them haphazardly and pour sauce on? I always line mine up and then cant fit them all in just one baking dish, but if I can do it this way I def will!! Do I need the vodka? Can I substitute for something else? I made this last night and everyone raved about it! It was delicious! Thank you so much. Do you know if this would hold up for a good freezer meal if I packaged it up before baking it? And if so, how long it might need to bake if frozen? This was very tasty but turned out with a lot of liquid. Followed the instructions. Should I have drained the tomatoes? YUM! This is in the oven as I type. Super excited to eat this tonight! Pretty sure my family will be raving about it. I’m not a fan of vodka so I left that out but did everything else as the recipe stated. It looks AMAZING. I am so happy to hear that! Thank you Stacy! My family LOVED these! Thank you! My daughter asked if I could add these to our regular recipe rotation because she loves them so much, and my other kids agreed. That is so amazing!! Thank you Stacy! Are the canned San Marzano tomatoes whole and peeled or crushed or diced? Thanks! This turned out so great i cannot wait to make it again! Thank you! I hope you love this Ginger! Awh that is so great! I hope the dinner was amazing, Barb! Thank you! Hi! 2 questions! 1: Do you use fresh mozzarella or the hard mozzarella? 2: If I made this the night before and cooked the following evening would that be OK? When I first saw this recipe I knew I had to make it. Omg did it deliver. SO GOOD! I could eat these forever. New staple in my house. Thank you! Ah that is amazing! Thank you so much Jenny! Made this dish last night (along with the Tuscon soup) just omitted the sausage for a Kisher option and my family could stop eating it! Absolutely delish! I am so glad you loved this Agne! Thank you! There I s no way I can come up with the particular caned tomatoes called for what else could I use ? Hi, can you clarify when you say “2 (28 ounce) cans of tomatoes”, do you mean for a total of 28 ounces of tomatoes, or a total of 56 ounces of tomatoes? Thanks! We were a little bit short on a couple ingredients, but overall this recipe came out really good!! We subbed ground beef for sausage and it was very tasty. I can’t eat pork– any other meat suggestion instead of the spicy sausage? I was thinking about throwing some chicken in?